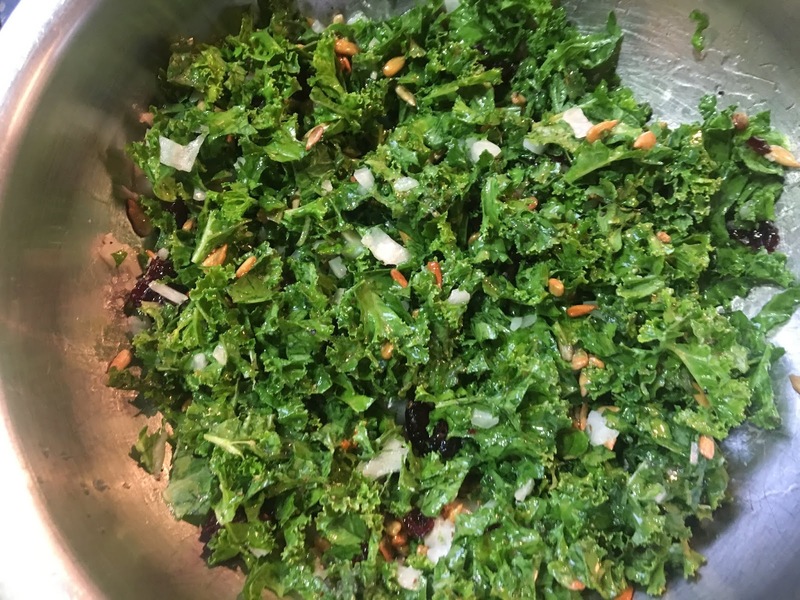 The secret to this super salad (delicious and nutritious—packed with vitamins & antioxidants) is finely chopped kale . . . and a balance of ingredients. My inspiration was actually a bagged kale salad mix that I ate at a meeting earlier this week. 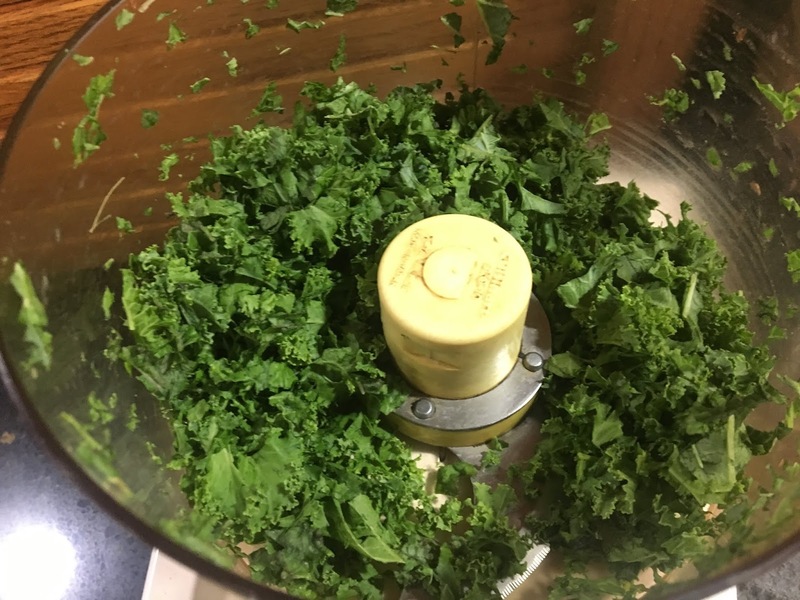 Using curly kale from Barry's garden, my goal was to finely chop it with a chef's knife. Then, it dawned on me to use the food processor. It worked like a charm and yielded finely chopped kale that was easy to eat! 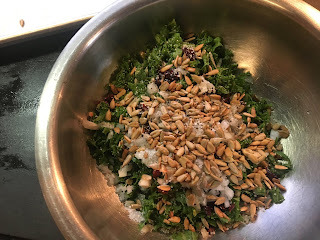 Toasted sunflower seeds and finely chopped onions added the crunch factor while dried cranberries and a slightly sweet dressing added the finishing touches to this salad. Barry pronounced it "Super delicious" and had more than one helping. Amounts are variable . . . my preference was to use a relatively high proportion of sunflower seeds and cranberries. 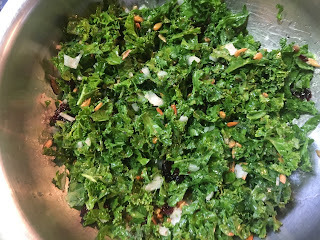 Although I generally dress salads at the last minute in this case I added it about an hour ahead in order to allow it to softer the fibrous kale just slightly. Variation Ideas: Add fresh fruit and other toasted nuts. 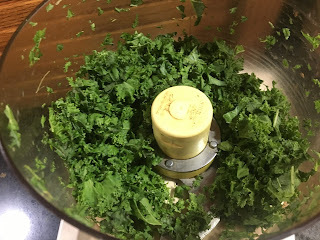 Add stemmed kale to the food processor and pulse until finely chopped. 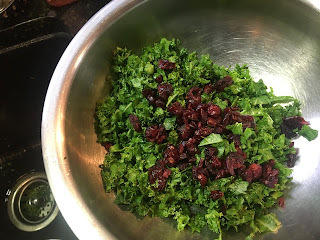 Transfer chopped kale to a bowl and adde cranberries, sunflower seeds and onions. Add dressing and toss. If time allows, add the dressing about an hour or so ahead of time in order for it to soften the fibrous kale leave. Season with salt and pepper as needed.